Quick and easy appetizer for when your friends surprise you and just show up hungry. Although I am far from being a pastry Chef or do I have a desire to be one. I do have a few desserts I like to make this being one of them. I make them in coffee cups, and serve cold. It may be a little late in the season for this recipe, but you should still be able to find some nice tomatoes out there. This will yield just about a gallon of soup. 2.5 lbs Tomato Peeled, seeded & small dice (to peel a tomato make a small “X” in the bottom of it and put it in a pot of boiling water for 2 to 3 minutes. once the skin starts to peel away place in a ice bath to cool). This is a fun one for a dinner party. The crab can be a little pricey so you can substitute any kind of cooked fish you want. With a sharp knife score the skin side of the breasts to make a checkerboard pattern. Watch the the preview outtake from my first video shoot. It took a lot of blood, sweat and tears… I am excited to share the full videos on this site soon. 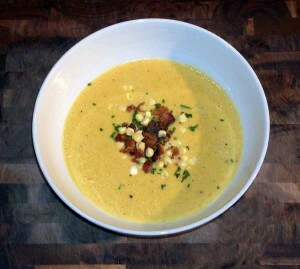 We will be making the fabulous corn bisque below, as well as tender flank steaks with a savory Gorgonzola sauce together. So sharpen your knifes, get the ingredients, and check back soon for the full videos. I spent a lot of time and thought on how to write a bio about myself. Until one afternoon while reading other Chefs bios, it occurred to me that I did not want the website to be about me, I wanted it to be about the food. That being discovered I decided to let the recipes speak for themselves. with the hope that someone or preferable multiple someones would be able to learn something that I’ve wanted to pass down. 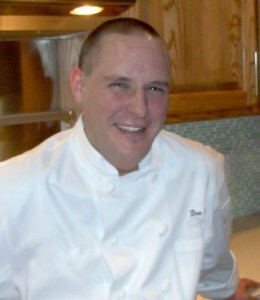 I’ve been a chef for twenty plus years, and have worked with some very talented Chefs. I’ve also worked with a lot of not so good ones. The skills, techniques and tricks learned from the good Chefs has proved to be priceless. I would like to share them with as many people as possible. believing this website to be the best vehicle for just that. This site will be updated on a regular basis. With videos recipes and good clean fun. 1 cup cooked chopped bacon, corn kernels, and chopped chives for garnish.